Our heated indoor swimming pool is now open for your enjoyment during regular Camden Clark Health and Wellness Center hours. Camden Clark’s Elite Swim School is offered during spring and summer months. Sessions upcoming on the following dates: April 16-May 9, May 20-June 13, June 24-July 23. Class Space is limited so make sure to reserve your child’s spot as soon as possible. For general inquiries and pricing info call us at 304-424-2348. Private swim lessons are available all year and by appointment. 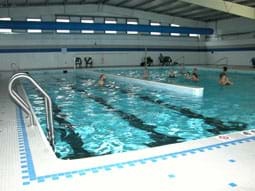 We also offer vigorous water aerobics and therapeutic arthritic water exercise classes. These classes are a great workout done in a low-impact environment—great for people who are tired of hurting after exercise, but want to be challenged. For the schedule of upcoming classes, click here.